Inspired by Ancient Greek symbolism of a snake eating its own tail in an endless circle, the Ouroboros Lounge represents infinity and nature's endless cycles of birth and rebirth. 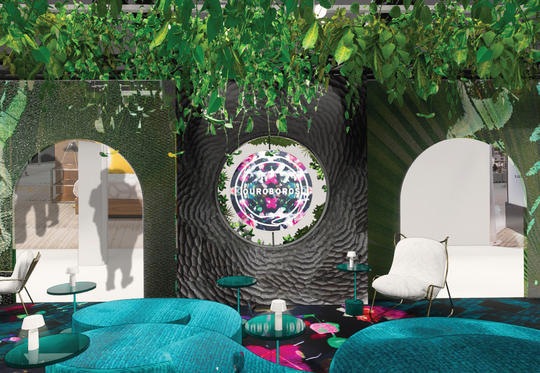 The mysterious and ethereal space contrasts floral, organic shapes with hard, reflective surfaces all brought together with a bold and colorful kaleidoscopic carpet. BAMO principal, Anne Wilkinson and her team bring this celestial vision to life with the help of booth sponsors in the perfect collaboration of amazing talent.